Jewish teen who prays for welfare of sick people on Temple Mount forced to leave after Waqf employee sees her lips and head moving. 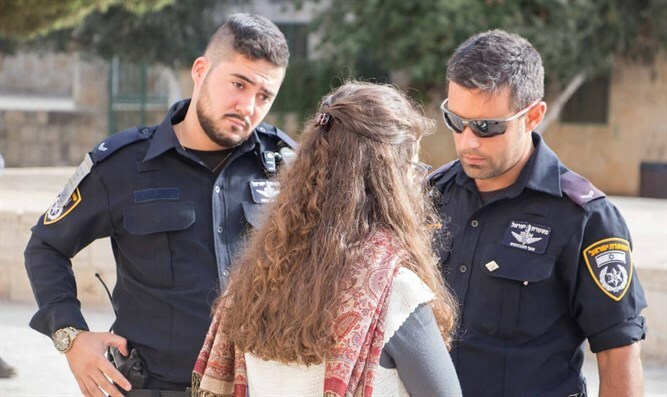 Sarah Rivka Cohen, a 19-year-old resident of Ramat Beit Shemesh, was removed from the Temple Mount Wednesday after she was identified by a Waqf employee as having uttered a silent prayer. Cohen spoke to Arutz Sheva about the event and how it affected her. "They saw me muttering and rocking a little to myself and they found me a page with a list of names [to pray] for healing and marriage, and a policewoman snatched the page and announced that she had found a page with names for medicine. That was my 'crime,'" Cohen said. "We went with the group and there was a place where they stopped before the Holy of Holies and prayed. I stood by myself on the side and it's hard not to rock when I pray, even though I know that according to the law it is permitted to pray on the Temple Mount. They approached me and told me to stop because it was a provocation and that was it." When asked if she did not hear a briefing forbidding a prayer or a Jewish murmur on the mountain, she replies that on other days there were indeed briefings on the matter, but on that day they did not hear such a briefing. "Yesterday I went up with the same page and I said all the names and nothing happened, it did not bother anyone," she said. "Today there was a Waqf person who pointed at me. Cohen described the police action as a humiliation, especially when such events occur in front of Muslims on the Temple Mount. "The policewoman pushed me. She wanted me to run quickly, even though they said to walk slowly and respectfully on the Temple Mount," she said. "She threatened to put shackles on me and that it was chutzpah and provocation." "On the way out of the Mount I turned around so as not to turn my back to the site of the Temple and to leave the place, and she pushed me and almost knocked me down. The desecration of G-d's name is terrible. I was humiliated in front of all the Arabs. Blessed be the Lord, there is improvement, but the desecration of G-d's name is still continuing, and it is still forbidden for a Jew to pray on the Temple Mount. An investigation was not carried out, and Cohen said that she had waited about an hour, despite being told that within 10 minutes a report would be completed. "They wanted me to sign forms of delay and I did not sign them." Cohen was informed that she could not ascend the Temple Mount until she had a conversation with the station officer. According to her, , a few years ago, when she had a similar experience, she was forced to try and coordinate such a conversation for six months. In her estimation, this makes it difficult and complex. When asked if she knows what she intends to say in that conversation, she says that things are still unclear to her, and she is not at all sure she will go to such a meeting: "I do not know how much I will say." "I want to come and say that I will continue to pray on the Temple Mount. It's not against the law. If more Jews dare - and unfortunately it is daring - to pray, even if not shouting, something will change. Although the policemen are nicer than before, we must not become accustomed to this reality in which we are humiliated. As a result of these statements, Cohen was asked how she relates to the young people who claim that in order to prevent humiliation and desecration of the Temple Mount by the Muslims, they do not even come to the site. "I could not pray, but if we do not go then the the desecration of G-d's name will continue and that is what they want, to deter us so that we will stop coming. I think that the desecration of G-d's name is not in the prayer of the Jews, but in the response of the policemen, and I will not stop praying because the police decide to desecrate G-d's name." The police said in response: "During the regular visits to the Temple Mount area, one of the visitors who violated the terms of the visit was asked by the police to identify themselves and leave the Mount area for further investigation. The visits continued as usual. The Israel Police is working to enable every person to visit the Temple Mount, regardless of religion, race or gender, and does so with a system of balances and considerations in order to maintain public order there."